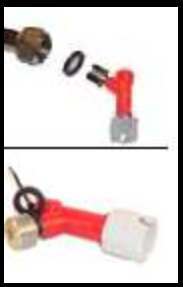 Use this to easily connect your existing comercial draft systems threaded nut for the gas in of the tap to a Soda Keg! (threaded for standard 3/4 nut that connects to your tap). This disconnect is adapted to shank thread that will make a quick connection to a standard draft thread like the one found a standard beer tap. It will thread right in in to your comercial taps nut that attaches to your gas in on your tap. No cutting or splicing. Gas pin C-Keg Disconnect adapted to shank thread.